ne of my earliest memories of the little brick house is the sound of highheels on the pavement. For me, this meant it was time to get up and start the day. Hidden beneath the floorboards were my treasures: shoes, candy, dolls. No one else knew this secret of my room. I wonder if the people who live there now know the house’s secrets. In the fifties and early sixties, the house was, by Bronx standards, located in a well-to-do neighborhood, mixed with Irish Catholics, Italian Catholics, and the occasional Jewish family. I was one of the many second-generation Italian-Americans. 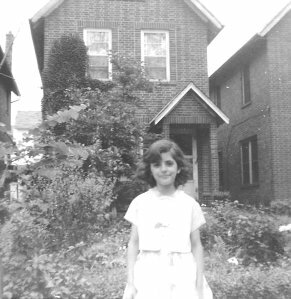 The house was brick, with a front stoop and a long front lawn. That was it! The Lawn! That’s what made us well-to-do. The house itself had three bedrooms, a kitchen, living room, and dining room. Downstairs was the dusty, cold and scary basement where my imagination could and did take me on many a journey. Probably the most time I spent was in the “Spider Place.” It was a cave-like room formed under our concrete back porch. I have no doubt spiders lived there but it was always too dark to know; besides, knowing would mean my father had been right and I should have stayed out of the place. Many months went by with the neighborhood kids and me removing rocks from the dirt-floored room. Sometimes the movement of our chores would cause the dust to move about and choke the air. Yet we had a mission: to find out what was behind the green door in the darkened corner of the room. The door was only visible with a flashlight, and we knew deep secrets and worlds lay beyond the door. After several months of work, we had reached the green door with the diamond knob, but we could not open it because over time it had sunk about three inches into the damp dirt. So our new project was to free the door. Finally, with breathless anticipation, we turned the knob and pulled. The door fell on us. Behind it was only the wall my father had placed the door against years ago when he first bought the little brick house. It was only one of many disappointments in my young life. I lived in the house with my brothers. My father was controlling and very protective. My mother was clueless. Here was the daily routine: Dad would leave the house at 7:10am every weekday morning. Then we were free of him. Mom’s life pivoted around my father. She was married to both him and the house. So when he left, she would lock the door, turn on the radio to WNEW, singing to the tunes we learned to hate. Regardless of the weather, my brothers and I were not allowed outside past a line my father had pointed out. It consisted of six sidewalk block sections past our house. We were warned not to cross that line. This made my brothers and me targets for all the neighborhood kids. Finally, we had had it! We packed our weapons and waited at the line. The bullies came. We crossed over and I beat those kids with a three-inch, white, patent-leather purse. Boy, they could run fast. Needless to say, the neighbors came to my parents to complain. They told of and showed my parents the bruises about their darling children’s eyes and heads. When my mother questioned me as to how my little purse could do so much damage, I opened it to reveal a load of pebbles gathered and placed just moments before we crossed the line. When Dad heard, I remember one of his few smiles, and he lifted the imaginary barrier. No more bullies for us on Bussing Avenue. My life on Bussing Avenue consisted of many such self-created adventures, and it seemed to me that living in a big city safely outside its main portals again made me special. Why? Because I could take a bus or a train anytime I wanted and be in the heart of New York City or venture into a nearby park like Van Cortlandt Park and go ice-skating in the winter or take a bus to Tibbet’s Brook and go swimming. Of course my adventures often were my parents undoing. Sometimes I would venture past P.S. 87, smelling honeysuckle on the way, or stop at the schoolyard and play on the monkey bars. Other days, I walked past the school toward my grandmother’s house on Barnes Avenue. Usually, I would forget about Grandma’s and just walk until I looked up and realized I didn’t have a clue how to get back. Not to worry, I would simply smell a meal cooking, knock on the chosen door, tell my story, and call Dad. Strangers were wonderful, but Dad was ticked. Usually my ventures took me to Gunther Avenue and up to Pitman. There I would find Danny’s Candy Store. Besides candy, Danny offered a wide variety of good food such as pizza and hot dogs. Danny seemed to hate kids. We in turn hated Danny, but we needed each other. On Sundays, Mom would give me a quarter to go to church at St. Francis of Rome, but I usually took a detour to Danny’s. I could fill up on candy and pretzels. Rather than heading to church, most Sundays found me heading back to Gunther Avenue with my candy in a small white bag and a smile on my face. I’d be going to Lucia’s house where she lived with her father, Alex. Alex’s wife had died when Lucia was six, so he became both mother and father to her. I always envied how she could just talk to her dad and not fear him. I can’t say for sure why Alex hated the church, but it served my purpose. I had a safe place to hide with my candy, and Alex would sit with me and watch the Yankees on television. I guess I told Alex things about my home life because he sure hated my parents. I remember the day I heard my father looking for me. He bellowed out my name. I shook in terror and ran pitifully to the door of Alex’s house. Alex had other ideas. He told me to sit down, and he’d handle it. I was terrified. Alex was a big man by any measure, and my father was a nasty man of five foot six inches in shoes. When Alex went out to talk to my father, the yelling stopped, they spoke, and I stayed on Gunther Avenue until it was time to return to Bussing Avenue and home. My father never told me what Alex said, so my attendance at St. Francis church did not improve. In fact it got worse. One day, I had forgotten it was Palm Sunday and all the “good Catholics” were streaming down Pitman Avenue with palms. I felt caught like a cornered animal. If I went home without palms made into crosses, I would be found out. Terrified, I asked Alex what to do. He told me to run to church and grab some palms. I did. I ran past the vestibule and past the grave of the dead and buried guard dog whom legend said would kill anyone who harmed the nuns. (I often wondered if that included using my twenty-five cents a week to buy candy.) Anyway, I ran into the church and started to cry. My tears were sincere but my reasons were not. I told the men in attendance that I had gotten overlooked and did not get any palms. They looked at me suspiciously and smiled. Then, they loaded me down with palms. I ran again past the sleeping guard dog but in further defiance stamped my little shoe carefully on his mosaic face and ran happily home. I remember once going on a bus to the Bronx River. I would walk up to the el on 233rd and catch the bus. There we would sled down a hill with great skill. The objective was to reach the river, but turn your sled just in time to avoid going into the freezing river. I was very good at this. But one day I saw across the river a car skidding off the parkway. A man dressed like my father and driving his company’s Chevy Impala got out of the car. I only noticed him because he had pulled off the Parkway so quickly. Then we saw his face. I realized that I was the target of glare. Once again I felt a cold chill run through me and it wasn’t the snow. Life was good in spite of my father’s occasional rages. I lived in that house at 1807 Bussing Avenue until I was thirteen. That was the day I came home rather bloodied by some neighborhood bullies. Not to fear, they didn’t look so good either. Anyway, my father didn’t believe my story about my bike hitting the schoolyard’s chain-link fence, so the real estate agent was there that night. The house sold quickly, and we moved to New City in Rockland County. It saddens me to this day. My Bronx was no longer mine.